Lent; the forty days that precede the three day Triduum of Holy Thursday, Good Friday and Holy Saturday in the Christian calendar, may seem to be a bit daunting for young parents to explain to young minds. The three points of Lent… namely, prayer, fasting and alms giving, need some concrete examples of how to do this simply in young ones everyday lives. And, there are excellent suggestions given along the way here, in a very compassionate tone, that children will understand. 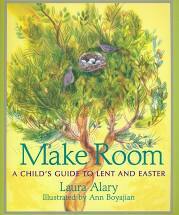 There is a story to be told in the Lenten journey and young readers love stories. That is also accomplished quite well here. And there are powerful emotions at play here for your youngest reader to experience at a very elemental level, without being overwhelmed. It is handled both with tact in wording and an understanding of young readers. Waiting is something children can relate to, and as families anticipate the joy of Easter, with planting of seeds, new clothing and awaiting the arrival of the Easter Bunny, the emphasis in many homes is also for the waiting and growing in small deeds for the gradual transformation of their inner lives, that they they see it reflected in the rebirth of nature. Long ago, Jesus went out alone into the desert to get ready. Deep inside he felt that God had important work for him to do. But he needed help to see clearly the way ahead. For forty days and forty nights he was in the desert by himself. During Lent we pay attention to how we live. Does what we say and do make the world a better place? Does how we live make God happy? Is there anything we need to change? “Be kind to all people, not just the ones who like you. Share so that everyone has enough. If someone hurts you, ask God to help you forgive. Do not store up angry thoughts. Lent is a time for emptying, for sharing, for giving away. During Lent we make our lives more simple. We even give give up some of our favorite treats and snacks. I like this approach to Lent and Easter for young readers because it allows them time to process the events, but also most importantly some concrete ways in their young lives that they may feel and participate in the journey of Lent that leads Christian believers to the glory of Easter Sunday. And Ann Boyajian’s illustrations have a softening reality of children doing the very things suggested by the text, as it interweaves the story of Christ’s forty day journey with very positive suggestions of how young readers can participate in the preparation for the inner transformation that is part of the Lenten journey. As one critic suggested, this book is “poetic, practical and theologically wise” and I would agree. If you are looking for a book for a young reader to explain both Lent, the journey it involves, with many practical applications to fit into the lives of young readers today, this is a fine book with which to get started. It’s approach is positive, life-giving and sure to build a spirit of renewal that is much needed in the youth of today. The word “sacrifice” may be out of date, but here, it is put in such a way to be both palatable and beneficial, not only to the giver, but to the receiver as well. And that is a great message for young readers to hear in a world where in recent years, the SELF, seems to reign supreme.